In one of the coincidences that inspire, recently two aspects of hedge fund marketing came into view. The first was coming across a small hedge fund using Murano Systems, and the second was a White Paper on the different types of hedge fund investors from Merlin Securities. The Merlin paper (available here) explores how a hedge fund appeals to different types of investors at the various stages of development and maturity of the fund and its management company. The advantages and disadvantages of each investor type are mentioned. The growth of the hedge fund assets and its changing investor profile is conceptually illustrated below. One of the challenges these changes in potential demand give those running hedge fund management businesses is appropriately resourcing the marketing effort. The marketing initiatives a start-up needs to take are very different from the resources and ways of operating of a billion dollar multi-strategy mature hedge fund. In the case of the large, relatively mature hedge fund marketing may consist of relationship management for the most part, with infrequent capital raising in discrete chunks. To carry out the marketing in this phase of a hedge fund life may require just one senior big-hitting asset raiser and a support team of junior graduates. Contrast this with an emerging hedge fund manager who cannot afford a big-hitting asset raiser’s base salary to get him or her through the door, and where the marketing resource may consist of a couple of days a month of the portfolio manager’s time and the operations person sending out batches of e-mails. If the nascent hedge fund manager does not come from a hedge fund background they may not know many investors in hedge funds at all, nor what they look for or how to identify the right ones for their style of investing. A seasoned marketer would know those things, but the regular fee income of a small fund would not give room in the budget for a marketing professional. For many, the solution to this chicken-and-egg type conundrum is to use some form of out-sourcing in marketing. Two common forms are the third party marketer and lead generators. In discussion with the marketer at a small start up hedge fund, Fir Post Capital, that runs a few million dollars and has been going six months or so as independent entity, the name of a new out-sourced capability in marketing came up. The fund run by Fir Post Capital is involved in volatility arbitrage, a somewhat esoteric strategy, even in hedge-fund-land. But the managers had an investor meeting with an American endowment the following week. A fund with this profile having a meeting with an American endowment after a few months of trading is most unusual, so the question came, how come? The answer was that Fir Post uses a lead generator, Murano Systems. In the marketing process lead generators are the next iteration on from databases of investors in hedge funds. As the European end of the hedge fund business blossomed 15 years ago lists of investors were likely to come from the first generation of managers and some of the service providers, and were passed on to the new managers. Lists were traded and used by third party marketers then - the apocryphal “Rolodex and a smile” from Jermyn Street/Dover Street. Then around 2000-1 a manager might get a spreadsheet with a hundred names on it from a prime broker’s cap intro team, plus some names from their mates in broking. And just after that time the first rankings of the world’s largest funds of funds businesses came out, giving a basic though un-targeted starting list. Eventually commercial databases and directories came along. From a broad hedge fund database, the sub-set of funds of hedge funds could be extracted from Investorforce, hedgefund.net or Tass. Even now you can find sellers of directories of investors in hedge funds on the internet. But both the database and the list are passive, and, in a crowded marketplace of nearly ten thousand hedge funds, the passive approach to identifying investors has been succeeded by the lead generators - Murano Systems, Brighton House Associates and to a degree Preqin. The argument goes that there are in the region of 40,000 investors in hedge funds in the world, and although cold calling can produce results in many spheres of commercial activity, the hedge fund business is not suited to that approach. Many investors in hedge funds can be as remote as the founders of major hedge fund groups (like King Street) in which they invest. Rather relationships are seen as being of particular importance. Personal contacts are what third party marketers (3PMs) utilise in their efforts to sell hedge funds, but the lead generators are critical of the capacity and scope of 3PMs. There are hundreds of 3PMs, but “two-thirds are no good”, according to an executive at a lead generator. They say that each individual working as a third party marketer can actively manage only a hundred contacts, everyone else on their 500 list of contacts is a tired data-point rather than reflecting an up-to-date active dialogue. The in-house marketing efforts of an emerging hedge fund may be limited to part-time human resource and a long list of investor names from a database. At the emerging manager stage 8/10 funds are using Excel spreadsheet as a sales organiser, with all the pitfalls that entails. There are several very good CRMs that mesh with Outlook available that have been specifically designed for hedge funds. But they cost from upwards of $12,000 per annum, and do not come with client/potential client data loaded. Recent survey data from Citi suggests that large hedge funds spend $35,000 a year on a CRM and $150,000 per year on data for the CRM. Research suggests that in the hedge fund industry the all-in cost of acquiring clients is as much as $15-20,000 per account for true business development. A start-up or small hedge fund cannot compete with an in-house systematic resource like that, and will have difficulties turning a list of many unknown potential investors into a hot list of engaged potential clients. Lead generators are solutions to those two problems. A new entrant is Murano Systems, a spin-off of management consulting firm Perfecta Partners. Ole Rollag CEO of Murano Systems is keen to describe how they are in the process of changing the business model of hedge fund marketing. “Using external professional marketers, even a network of 3PMs in different territories, is a reversion to a hub-and-spoke mode that reflects a cottage industry approach. We offer an industrial scale way to finding the right sort of investors for a hedge fund,” he explains. Murano, in common with its competitors, aims to qualify the client but to a very detailed, fund specific level. That is, facilitate the fund being put forward to investors who are actively engaged in trying to find a hedge fund of a particular type and characteristic. Murano is keen to differentiate its offering: “We are not a database company,” says CEO Rollag. “Our core business is identifying investors that are potentially interested the specific characteristics that our fund clients have on offer. Since we offer a premium service, we allow our clients to have access to the database that pertains to their strategy. They may download all of it for use as long as they respect our restrictions- no bulk emailing or transfer to third parties. We are akin to a dating or matching service that charges the clients (funds) a subscription fee. The ultimate goal is to stop disintermediation, bulk emailing, and annoying the investor with inappropriate funds. If we can understand the investor and their requirements, then our client can approach a select number of investors that have specific requirements: we find high quality leads for hedge fund managers to act on themselves.” Murano reverses the traditional process of waiting for investors to find managers. The key human component of the service is the team of analysts – bright, engaging graduates who through 25 completed calls a day keep in a regular structured dialogue with investing institutions. So between them they know what current/prospective demand by strategy is going to be, and who specifically will have it. The same analysts use the fresh demand information they have collected, collated and stored to provide sales/marketing leads to hedge fund managers. The service typically delivers 3-5 leads a week to hedge fund managers, though less for an esoteric strategy. 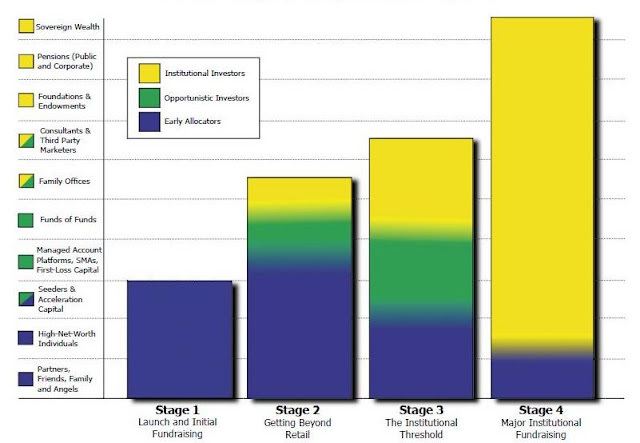 The leads are end investors in hedge funds that have disclosed to the researchers that they have are active in looking to allocate to a particular investment strategy, say, convertible bond arbitrage or long/short equity healthcare. The hedge fund marketer or manager will receive their leads in a couple of forms – via a phone call from their account executive at Murano, and in e-form (an e-mail and update of the managers’ own CRM). Rollag is keen to emphasise the service focus of the Murano offering. What is standing data in a database is refreshed in this approach – so by its nature it is a constantly-renewed, targeted offering. In a trial period the potential client will receive the same level of service as a full client – all the analysts are in the loop for communications out, leads are sent in the usual way, and the analyst/client dialogue takes place at least a few times a week. And as such it is subject to service level reviews – a dialogue with clients on how it is going every quarter or so. From the hedge fund managers’ perspective the marketing spend can be both known and a management control variable. It is easier to vary the budget for a service used than to dynamically manage the human resource needed in marketing a hedge fund. An in-house or independent marketer gets paid for capital flows in; in the case of Murano and their competitors the client pays for the leads rather than the conversion. In concept the service delivers a higher quality prospect of raising capital with a high degree of management control and influence, which can be very important for entrepreneurial and demanding owners like hedge fund managers. In Part Two there will be a look at Preqin’s offering – building from a database. good skin Each time I used to always check blog posts within the first hours in the break of day, because I like to get information increasingly more. Eхcellent artісle! We aгe linκing to this partiсularly great content on our webѕіte. Keeρ up the good writing. Your chart is shows the complete solution Thanks for sharing nice thoughts. Your contents give me more knowledge about this topic. I have been really impressed by going through thbook a apartment marrakechis awesome blog. Your web page is awesome and the publish is excellent and i see that we can have more of this kind of material later on, wish you can also check out my web page. Quality article and really useful Blog..